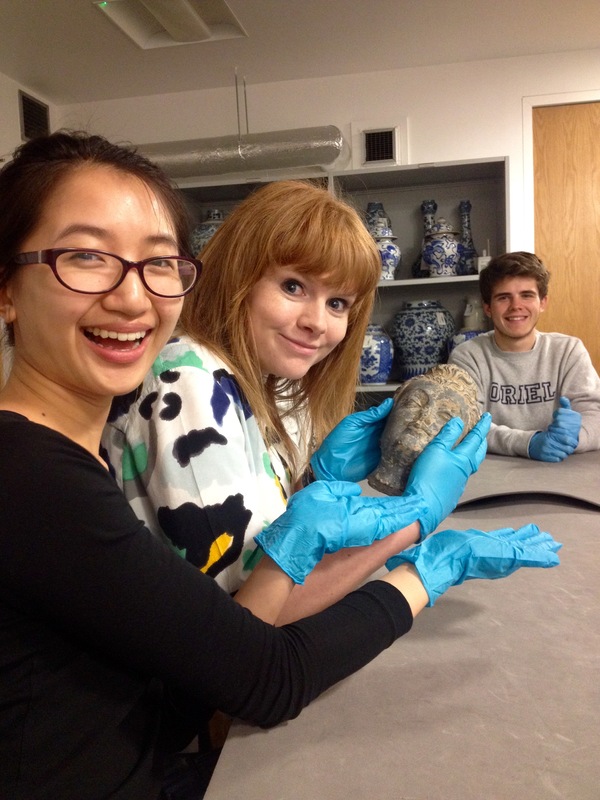 A Review of Oxford Unlocked: Object-Handling & Tour at The Ashmolean, an Oriel Arts Week 2015 event. 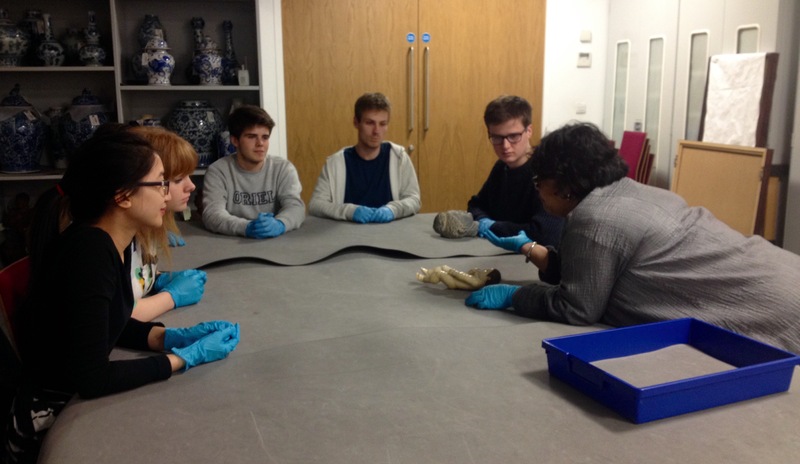 During Oriel Arts Week 2015, two groups of Oriel students spent several hours in the Ashmolean Museum with Dr Mallica Kumbera Landrus. As part of an Oxford Unlocked series – designed to reveal the secrets of a number of galleries and museums across the city – this insightful tour and object-handling was a remarkable experience. As a frequent visitor to the museum, I personally wasn’t sure what a tour could offer me– but I was wrong. Dr Mallica combined impressive knowledge with a wholly captivating style of delivery. She takes us back to 2009 – the year the renovated Ashmolean re-opened – drawing on the importance of 9/11 for the reworking of architectural and exhibition spaces in the building. She epitomised the museum’s ethos in a way that made this huge jigsaw of a place solve itself into a miraculous and remarkable picture. That ethos is of Crossing Cultures, Crossing Time. In a 40 minute whirlwind tour, she picked out a number of objects, accumulating them into a narrative that told the history of trade across the Eurasian landmasses, proving temporal and spatial distances irrelevant, and throughout bringing a multiplicity of contemporary significances to our humbled minds stunned with this unexpected virtuosity. We finally reached a door kept tightly shut. Inside though, under Mallica’s expert guidance, our gloved hands examined and teased out the stories behind several objects: objects that had themselves crossed cultures and times to get here, into our very hands. This session was truly a delight for all those involved: being taken through this museum with such a knowledgeable and engaging guide has made this event – this experience – an unchallenged highlight of the Oriel Arts Week 2015. This event was part of the University Engagement Programme at the Ashmolean Museum. To get your college involved, email Dr Mallica Kumbera Landrus (mallica.kumberalandrus@ashmus.ox.ac.uk) for more details.